This is a guest post written by Aaron Ross of Predictable Revenue and Matt Smith of Full Stack Sales. 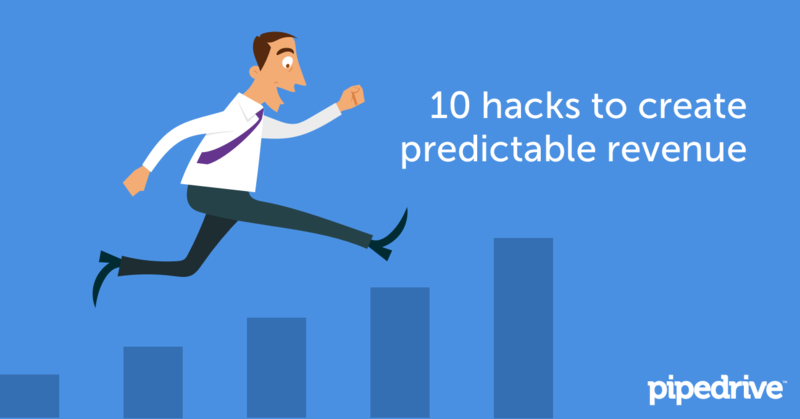 There’s a system to help reduce the variability in your business called Predictable Revenue. Finding new customers can be difficult — so you need to focus on developing a system for lead generation. One way to improve your lead generation efforts is to implement new technology into your process. Leveraging LinkedIn lead gen apps like LeadFuze will allow you to piggyback on LinkedIn data to build your lead lists. Clearbit Sheets is another killer product for lead gen — all through your friendly Google Sheets interface. What most entrepreneurs don’t understand is that sales growth comes from lead growth. The more leads you have, the more deals you will close. Ergo, if you want Predictable Revenue, you need a steady predictable flow of leads. The saying “sales is a numbers game” is true. More sales email will lead to more revenue. By using these cold email tips from sales performance experts, you could work to increase leads by sending more emails. Write no more than five sentences. Don’t use industry jargon or buzzwords. Talk about what the prospect will receive — not what you do. Pitch the benefits of your solution — not the features. As venture capitalist Marc Andreessen said, “Software is eating the world.” There is a specific app for each part of the sales process — apps for lead gen, apps for email automation, apps for contract management . . . It goes on and on. If you are interested in learning more about Predictable Revenue & sales tech, check out my free course. How long do you wait until you reach out and try to upsell more products? What products specifically are you pitching as your upsell? What email templates are you using in your outbound upsell communications? Predictable Revenue is a best-selling book and is the sales bible for Silicon Valley according to Inc.com. You can get the Predictable Revenue e-book for free here. Also the infographic below explains the system’s key teachings. Number of sales emails sent per week. Number of leads generated per week. This is the number of people/businesses your team found that fit your ideal customer profile. Number of inbound leads received per week. This is the number of people/businesses that contacted your business about your products/services. They are looking to buy from you. These are not existing customers. Number of wins per week. This is the number of closed deals. On average, how much is each win worth in dollar terms? How long does it take to close each deal? These metrics can be tracked in a simple Excel or Google Sheet. Sales consists of three defined functions. Lead generation: Finding new potential customers. Closing: Securing partnerships with these new customers. Account Management: Managing your customers. If you have multiple sales team members you should specialize their roles by having them focus exclusively on one of the above functions. To improve your sales process you first must have a sales process. To improve your email open rate you must standardize your email subject lines. Testing components of your sales process like email subject lines allows you to optimize and improve your process. Use templates for everything, from emails to phone call scripts, so your sales reps can be more efficient. These templates set the baseline and the standard for all your sales communication. You absolutely have to keep following up with every prospective customer until you get an answer. A “no” is fine. But “no response” is unacceptable. “No response” most likely means your sales reps were too lazy to keep following up. You should ALWAYS be able to get a response. If that prospect says, “not interested,” that is a response. Which communication medium to use. Sales is evolving at a rapid pace just like the Internet. Because it’s part art and part science, it requires multidisciplinary study. Technology, marketing, psychology and finance all play a part. Study the new sales apps. Learn copywriting skills. Read psychology and persuasion books. Practice spreadsheet wizardry.